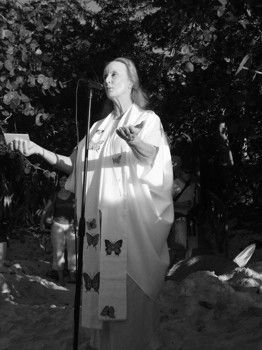 Many and heartful thanks to Anne Marie Porter who officiated at the Renewal of Wedding Vows at Trunk Bay on Valentines Day: Anne Marie, you exude love, and everyone who comes within your aura is filled with grace. Love City couples like Mollie and Dave Keuten, above, professed their continued commitment to each other and said “I do… again” at the fifth annual vow renewal ceremony. The afternoon sun cast a shower of golden rays, the crystal-clear Caribbean sea kissed the shoreline and 77 couples gazed into each other’s eyes. 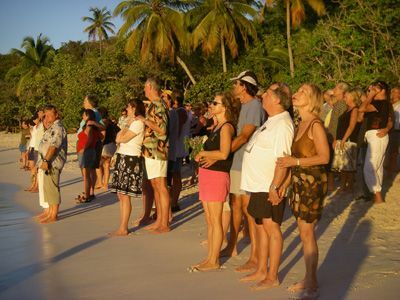 Love City was true to its name on Valentine’s Day, February 14, as couples with a combined 2,299 years of marriage renewed their wedding vows on the white sand beach of Trunk Bay. Now a St. John tradition, the Celebration of Love, was the brainchild of both Cathy Dove and the “Barefoot Minister” Anne Marie Porter, who held the first vow renewal ceremony five years ago. It’s just so heart-filled and joyful to see how many people honor their relationships, said Porter. No one takes Valentine’s Day more to the heart as Virgin Islanders. In no town I’ve ever been to do you know it’s Valentine’s Day like you do here. The vow renewal ceremony is the opportunity to delve deeper into the meaning of the holiday, Porter explained. Knowing the fragility of life makes the wedding union even more special, explained Dove. From newlyweds to couples celebrating almost 60 years of marriage, the Celebration of Love attracted a wide range of residents and visitors. John and Barbara Achzet were still the reigning king and queen of the day, with 59 years of marriage under their belts and counting. The couple, who have been at every vow renewal ceremony, changed things up this year by dressing more casually. Married for 59 years,so far,Barbara and John Achzet renewed their vows for the fifth time and looked forward to next year. John Achzet, on the other hand wore a T-shirt printed with the saying “Yes Dear” which was the secret to the couple’s long marriage, he explained. “That and she’s a keeper,” John Achzet said about his wife. Mollie and Dave Keuten, who were wed a year and a half ago in Michigan, had a different reason for attending the ceremony. Couples gazed into the Caribbean sea as the Rev. 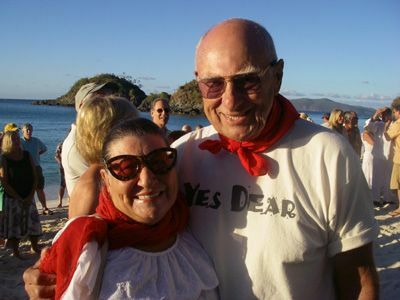 Anne Marie Porter offered an island blessing after the vow renewal ceremony. For Saffia and Don Durante the reason was simple. We’re here because love is grand, said Don Durante. The couples placed their hands over each other’s hearts and pledged their commitment to each other while asking for forgiveness. I give thanks for this present moment and I am grateful for you, the couples repeated after Porter. Please forgive me for any hurt I’ve caused as I give you my full forgiveness. Porter then led the couples in the renewal of their vows. With this ring I wed you anew and with all that I am, the couples repeated after the Barefoot Minister. 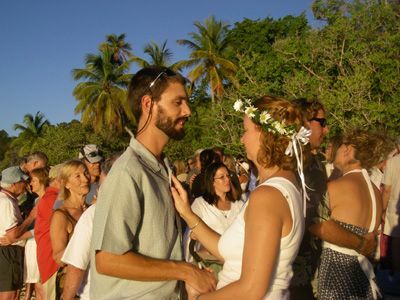 After Porter bestowed an island blessing, each bride was given a long-stemmed rose as the couples walked off to the sound of Michael Banzhaf on flute.